35 grams dried cranberries roughly chopped, soaked in hot water to soften, drained and pat dry with kitchen towel. 10 grams melon seeds lightly toasted, set aside to cool. Mix the dried cranberries & melon seeds evenly to the paste. Extra Kao Fen for dusting. 1) In a clean big bowl, combine the Kao Fen and snowskin premix flour and set aside. 2) Combine the water, icing sugar, cranberry sauce and margarine in a small pot to make the hot liquid mixture. Mix well and boil with low flame. Stirring occasionally with a metal spoon and bring to a boil. 3) Obtain 250ml hot liquid mixture and pour gradually to the flour. Use spatula to stir and mix the mixture to form a soft dough and leave it to cool slightly. Knead the dough again while it's still warm to a obtain smoother texture. *add more cooked glutinous flour to it if the dough is still too sticky. Filling : 55 grams x 9 pcs - Knead each portion a little to form a ball. Dough : 60 grams x 9 pcs - Knead each portion a little to form a ball, dust with a little Kao Fen to prevent sticky to fingers/hands. 1) Flatten the snowskin dough on your palm or roll it with a small roller pin. 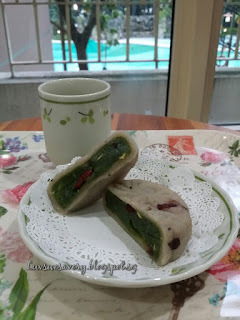 2) Place a ball of paste in the middle and slowly wrap it up using the snowskin dough to form a mooncake ball. 3) Lightly dust the mooncake ball and mooncake mould with Kao Fen before pushing it into the mould. 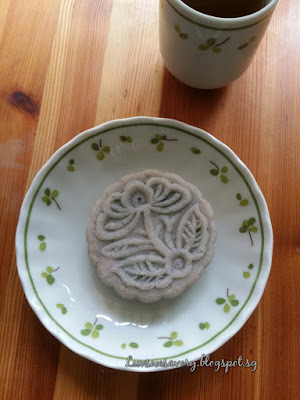 I used a plastic spring-loaded mooncake mould. Make sure that the edges are pressed evenly into the mould. Dislodged and repeat the process. 4) Immediately chill the mooncakes in an airtight container for several hours or overnight before consumption. Looked presentable. Glad to receive good feedback for this flavour as I've given some as gifts to my sisters and brought some to office for my colleagues. I've also made Pandan Snowskin with Custard and Pure Lotus paste filling ... to be shared in another separate post. Sounds good ! Wish I can have a bite cause I love both cranberry and green tea. Karen, you are very good, making your own mooncakes! 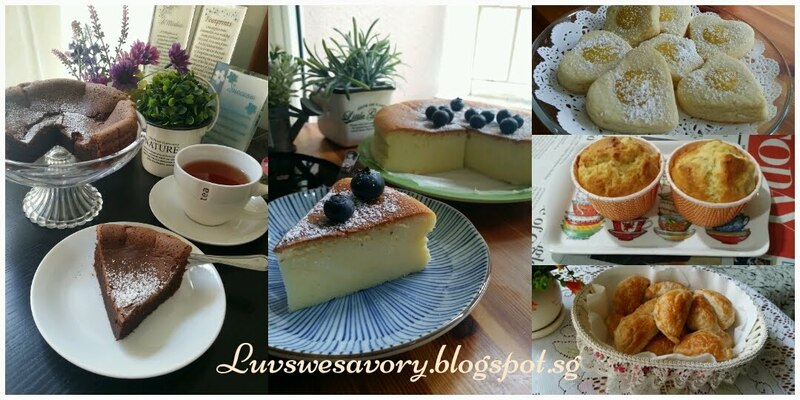 Generally, I only like to drink green tea but not very keen for desserts or cakes. However, having said that, I think your mooncake is lovely and is as good looking and possibly better tasting that the store bought ones! Thanks for your compliment, Phong Hong. Sounds good and special for a change for the green tea green bean filling. Hi Mel, yes it's the 1st time I used green tea green bean paste. Glad it turned out well. Nice snowskin mooncakes. 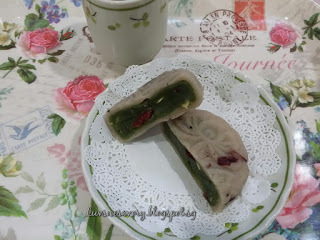 Not so used to green tea for moon cakes but I love plenty of melon seeds in the paste. Your mooncakes look very professional! Thanks ... still need more practice to obtain much better shapes ^-^! Funny that your kids' faces turn green when you cooked or baked something with Matcha... My son thought that everything is green is pandan!!! LOL! Hi Karen, this is one combination with I haven't tried. Thanks for sharing. Bookmarked. Hi Kimmy, you're most welcome and thanks for your compliment too. 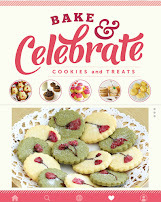 Hi Karen, these are beautiful, love the green tea and cranberry combination! Hi Cheri, Thanks ^-^ I like it too ... glad this combo it turned out well !